Perfect for speeding up food prep for this year\'s festive feast, Nicer Dicer Plus takes the cutting convenience of Nicer Dicer and takes it to a whole new level. Boasting a huge 1,500 ml capacity, with Nicer Dicer Plus you can cut in 11 different ways. You can slice, dice, cut, julienne, cube, wedge, quarter, grate and so much more. There are 5 blades, each made of ultra-sharp stainless steel. Just press down the lid and they\'ll easily cut through virtually any food. 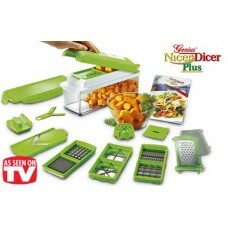 Each blade gives you a choice of different cutting sizes: cut into segments of 4 or 8, cube food in 3 different sizes... There's even a grater and a mandolin slicer, perfect for rapidly slicing cucumbers, carrots and potatoes. When you\'re done you can serve, or lock on the stay fresh lid and save for later. Food prep has never been so simple.